Kay Harper is a New York dancer, a newlywed gymnast working in Québec with an itinerant cirque. While she rehearses, her husband Theo toils away translating a biography of Eadweard Muybridge, a photographer fascinated by the science of motion. Walking from their apartment to the theater every day, Kay passes a toy shop, the Quatre Mains. She’s fascinated with a puppet in the window display, an ancient artifact held captive in a bell jar. Something about him calls to her. She’s fascinated, in love with the wooden similacrum. Each day and each night, she passes the shop, always stopping to stare at the man in the jar. The shop is never open. Indeed, it appears deserted so she’s unable to go inside to see the little man closer than through the protection of his jar and the display window’s pane . . . until one night, a light shines in the shop, then abruptly is doused. Kay and friends go out after their performance. She texts Theo not to wait up. The next morning, she hasn’t returned home. So starts Theo’s struggle to find his wife. The police are first sympathetic, then suspicious, then seemingly patronizing and indifferent. Her fellow performers are no help, except for Egon, the backstage manager. Theo remembers the toy shop, but again, it’s still empty. Somehow he feels it’s related to Kay’s disappearance. What he doesn’t know is that Kay took refuge there when she thought she was being followed . . . now she languishes, transformed into a puppet, in the shop’s back room. Returning to his teaching position in New York, Theo ignores the whispers that he’s involved in Kay’s disappearance. He persists in trying to discover her whereabouts. Then Egon, homeless when the theatre closes, breaks into the toy shop for a place to sleep, and discovers its secret. . . .
Theo, Egon, and a fellow professor set out on the trail of the owner of the Quatre Mains and Kay’s rescue, and Kay faces a decision she never expected. 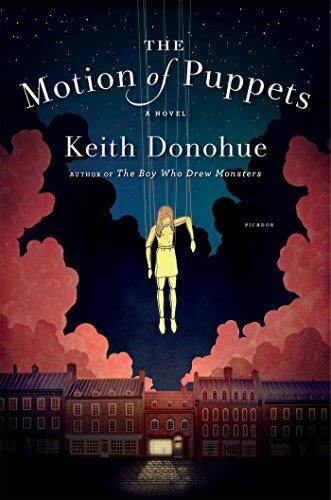 With a good portion of this story told from Kay the puppet’s point of view, the reader is given an uncomfortable view of the world from an inanimate object’s eyes. The puppets are humans transformed by ancient magic the shop owner has somehow acquired, through ownership of the man in the jar. Through the narration, the identity of some of those transformed is obvious, as well as how they relate to the mortal characters searching for them. Cruel, pitiable, driven to near-madness by their plights, they all reflect the traits they possessed in their former lives, with one exception . . . they can be changed, taken apart, and put back together, and never feel pain or die. Also the longer they exist in their current form, the fewer memories they have of their former lives. This is a novel full of glorious detail designed to surround the reader with a sense of beauty wrapped in a slowly tightening doomed embrace. In this day of unhappily-ever-after endings, the bittersweet conclusion of The Motion of Puppets will probably be anticipated. The reader may even reject its finish as unacceptable, objectionable, perhaps even cruel. Nevertheless it definitely will linger in the memory.